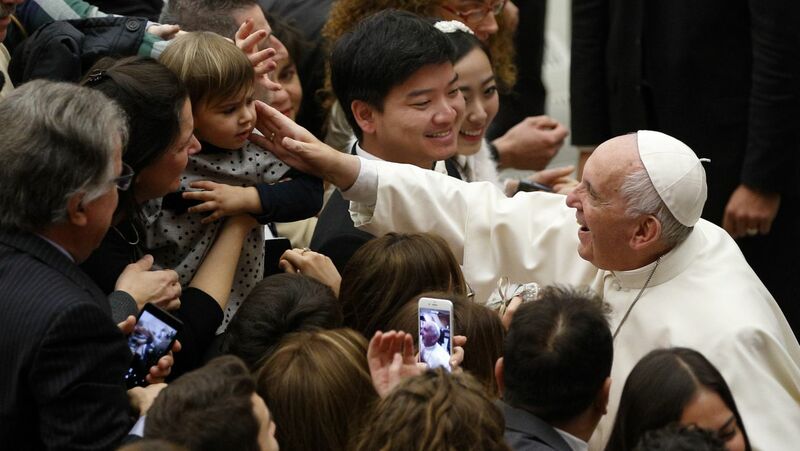 VATICAN CITY (CNS) — Everything in “Amoris Laetitia,” Pope Francis’ exhortation on the family, sprang from consultations with Catholics around the world and was thoroughly discussed by the bishops at the 2014 and 2015 synods on the family, Pope Francis said. “Either you have a pyramidal church where everything Peter says is done or you have a synodal church where Peter is Peter, but he accompanies the church, lets it grow, listens. What is more, he learns from this reality and sees how to harmonize it,” the pope told the Belgian Catholic weekly newspaper Tertio. Pope Francis said the “richest experience” of the church operating in a way that is not strictly “top down” came from the two meetings of the Synod of Bishops on the family. In preparation for the meetings, every bishop in the world, every diocese and Catholic organizations were asked for their input. He said the apostolic exhortation, “Amoris Laetitia” (“The Joy of Love”) is his contribution in response to the discussions. However, he said, “everything in there was approved by more than two-thirds” of the synod members. The sections dealing with ministry to the divorced and civilly remarried received more “no” votes than the other sections, but still had two-thirds approval. Asked about secularism, Pope Francis said a healthy separation of church and state is good for both, but a form of secularism that treats religion as a “subculture” and tries to confine any expression of religious belief to within the walls of a church or other sacred space is an offense to the dignity of the person, who naturally is open both to others and to God. Pope Francis also had some tough words for journalists, who must responsibly and carefully exercise their ability to influence public opinion. The media exists to promote exchanges and fraternity, to make people think and to educate them, he said. But, “given that we are all sinners,” the media, too, “can become dangerous,” especially when used to destroy someone’s good reputation or spread “disinformation” by relaying only part of the truth.